Runtime 7 Hrs. 3 Min. Great storytelling, details, humor. Great reader! i can truly see this made into a movie. just a really good book. could not stop listening to it. the lady who read it was fabulous also. Fantastic! Different from other period romances I’ve read. Great storyline and development between characters. I felt like I could connect with Amelia and that made all the difference in the story. Just finished the book, and completely enjoyed myself throughout. Unlike some others of its genre, there were no long, drawn-out , never ending dilemmas. Also, there were many exciting twists and turns that I didn't see coming. Becoming Lady Lockwood deserves a five-star rating. The author shines the brightest through her endearing characters. 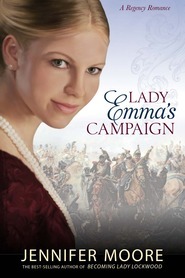 Amelia proves a surprising Regency heroine. She does not simply sit and wait for the romance to find her. In fact, in a Pride and Prejudice sort of way, she’s not looking for romance at all. She’s perfectly gratified with who she is, and she certainly doesn’t need a man to make her life complete. On board the ship, she works hard to win the hearts of the crew, assisting in the kitchen, mending sails, and learning from the ship’s doctor. Captain Drake’s character is no less well done. To his men—and Amelia—he appears a daunting figure of authority and discipline, but readers quickly discover that this is simply a mask. Between his softening feelings toward Amelia and his conversations with his first lieutenant, it is evident that beneath the dashing uniformed exterior, William Drake is a tender-hearted man. With its fast-paced plot, realistic and lovable characters, and poignant romance, Becoming Lady Lockwood deserves a five-star rating. I was kept up to early this morning finishing Becoming Lady Lockwood. I loved the time spent on the ship. It was interesting and well told. We learn a lot because Amelia was so curious and wanted to be useful. The time in England was the weakest part in my eyes. It felt a little rushed. Amelia Beckett is a strong character, brave, caring and a hard worker. She is also beautiful inside and out. Amelia grew up on a sugar plantation in Jamaica. She was married by contract to Lord Lockwood but never met him. Captain Sir William Drake believes that Amelia and her father the Admiral conspired to cheat his estate. He is bringing her to England to find out. The setting for most of the book is sailing from Jamaica to England in a time when France and England are at war. They are traveling in a military ship. There orders were to go in Frances water. There was lots of drama, action, romance and interesting characters. It is also a clean read. I did not put the book down till I had finished. I like how the story was told it got your attention from the first chapter and kept it. The story seemed to just flow. I was given this book to read so I could give my honest opinion of it and be part of its blog tour. I would give this a 3 1/2 star review if I could. It really isn't quite a 4, but definitely more than a 3. It is a pretty good debut novel and there is a definite opening for a sequel which could focus on some of the minor characters and perhaps shed deeper light on a few things left unresolved (perhaps that was the author's plan). There is a good mix of characters, an engaging plot, and good, realistic dialogue. The story flows well and it is a fast read, one that you could enjoy on a rainy (or sunny) afternoon. I love that the author has included so much conflict and loss at the center of the romance. I also appreciate that Amelia is a strong character not because she tries to equal her male crew mates, but because she contributes according to her strengths and even in spite of her weaknesses. I enjoyed the seeming contradiction of Captain Drake--strict, yet caring and considerate, strong, yet vulnerable. I did, however, crave a bit more back story about both Amelia and William as well as Amelia's parents and more clarity about the agreement between Amelia's father (Admiral Beckett) and her supposed husband (Lord Lawrence Lockwood). As it stood at the end of the book with what was revealed, I could not understand what advantage there was for Lord Lockwood to agree to a proxy marriage. Could the plantation really have been that important. And if so, why would it be to a man who already had a title and land. While a sequel could certainly help tie up this lose end, I feel it would have been better to do so at the end of this book and focus on the circumstances surrounding Amelia's mother's death in the sequel. But, even if there is no sequel and thus a few unfinished story lines, I still recommend this book to fans of historical regency fiction. Give in to love and romance and the open sea! Surely the NEXT BEST SELLER in REGENCY ROMANCE! And you the the makings of a GREAT STORY! Amelia Beckett, (Lady Lockwood) is married...on paper at least. But now she is a widow without ever meeting Lord Lockwood. And who should be the captain of the ship she will be traveling on? None other than Captain Sir William Drake, the brother of her deceased husband. Not only is he taking her to England, but once there, he will be taking her to court to contest the marriage and her inheritance of "a sizable portion of his family's estate." But Amelia is not the faint-of-heart kind of woman. But can she win the heart of the captain as well? I wasn't sure if I would like this book. I have read many wanna be romance novels and almost every classic romance to compare to. This book is wonderful!! Sure their could have been more details about Amelia and William's past as said by a previous reviewer but I don't think it needs anything else. It stands beautifully on its own. I don't think it was meant to focus on the past. I loved Amelia. She is strong but has her own faults as well and I adore William. Partly because he slightly reminds me of my husband when we first met. :) I also greatly appreciated the different perspectives throughout the book between Amelia and William. The romance was perfect. Simple, clean, exciting and intimate. I read this book all in one day and you would be able to tell by my disorganized house. :) I was pleasantly surprised by this book and if you like romance, which I'm guessing you do, then buy this book. Its worth it. I LOVE, LOVE this book.